Aging is a time-dependent decline of the body’s functional capabilities and is an inevitable course of life (as shown in the image below, extracted from the Wall Street Journal). The rate of aging though is highly variable among individuals. When evaluating health status, the virtual (biological) age and actual (chronological) age are both important. For this reason, scientists have long searched for reliable biomarkers of aging to determine biological age. Currently, there is no well-accepted aging biomarker that has been identified. 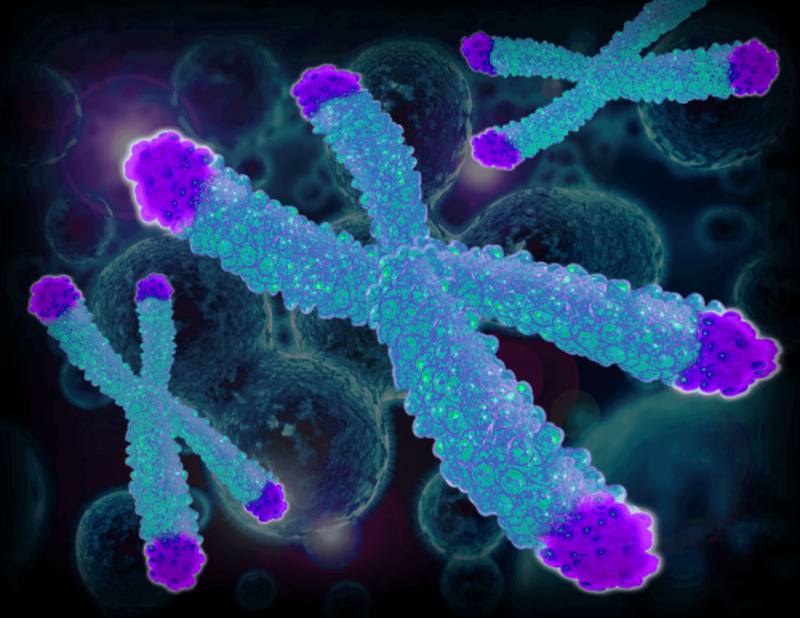 Among several potential aging biomarkers, telomere length has attracted the most attention. Telomeres are repetitive nucleotide elements at the ends of chromosomes and protect chromosomes from degradation and genetic information loss. In vertebrates, telomeres are GGATTT nucleotide repeats that can reach a few kilobases in length on each chromosomal end. Notably, cells lose part of telomeres with each cell cycle. 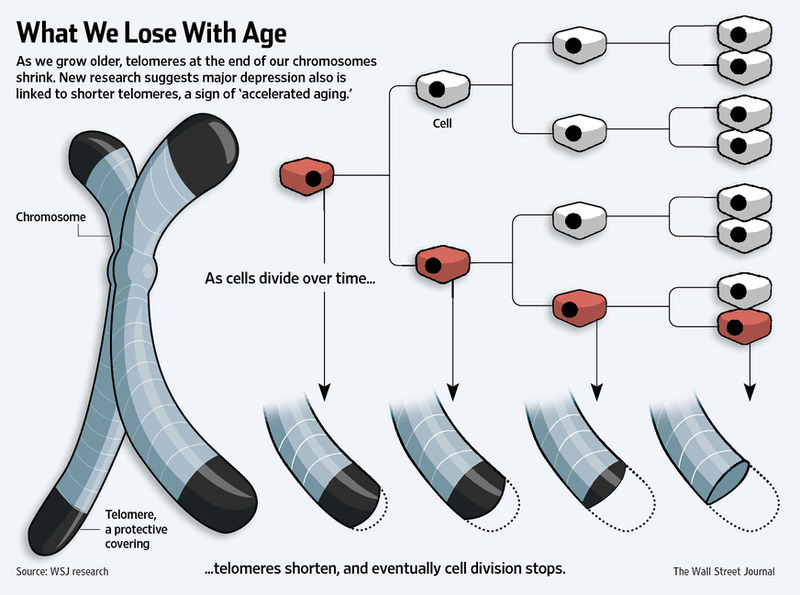 Although telomerase acts to elongate telomeres to counteract this loss, over time telomere length still decreases. There is increasing evidence to show that telomere shortening has negative effects on health conditions and has been linked to many health issues including aging and cancer. Quantification of telomere length, therefore, has great implications in many aspects of cell biology including chromosomal instability, DNA repair, senescence, apoptosis, cell dysfunction, and oncogenesis. Currently, there are two main methods to quantify telomere length: Southern blotting and quantitative PCR (qPCR). The telomere Southern blotting method was developed in the 1980’s, before qPCR was first introduced. Southern blotting is time consuming, requires a large amount of genomic DNA (gDNA), and tends to overestimate the telomere length. qPCR, on the other hand, is much quicker and easier, requires little gDNA and is suitable for a high-throughput setup. The main hurdle though for quantifying telomere length by qPCR is the primer design. Due to the repetitive nature of telomeres, primers tend to form primer dimers. Efforts to overcome this problem may impair qPCR efficiency and lead to unreliable results. When verifying telomere qPCR primers, two features must be examined. The first one is primer dimer formation. For trustworthy results, when no telomere template is present, the qPCR primers may not yield any detectable signal in 28-30 cycles. Secondly, the qPCR efficiency is derived from the template serial dilution and the acceptable efficiency range is between 90-110%. ScienCell Research Laboratories has developed telomere qPCR primers with special modifications that fulfill the stringent qPCR requirements. There is no detected primer dimer formation at cycle 30, and the qPCR efficiency is around 100%. These primers are ideal for both telomere length quantification and telomerase activity quantification. For more information, please visit our website for the relative or absolute telomere length quantification kits for human, mouse and rat, and telomerase activity quantification kit. I found this short video on YouTube very informative in explaining what telomeres are by a telomere biologist, Dr. Bill Andrews. Enjoy! Any plans for a bovine/cow telomere length kit?